Our Glamour Girl Makeup Brush Set sure is a beauty! 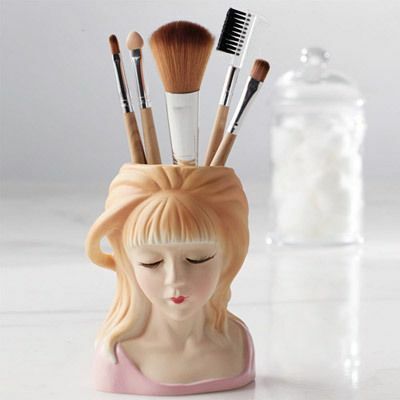 Retro, blonde bombshell with fabulous, faux eyelashes is crafted of ceramic in three-dimensional detail. This clever container comes with a set of five wooden handled brushes. Container, 4¾"h; brushes, 7"-7½"l. Hurry! Quantities are limited! I liked the picture of this and when I received it, I found it was exactly the same as the picture (how satisfying)! I am using this, not as pictured but as a pen holder by my living room phone! The brushes will be a gift later on in the year - 2 gifts from one item - can't beat that!